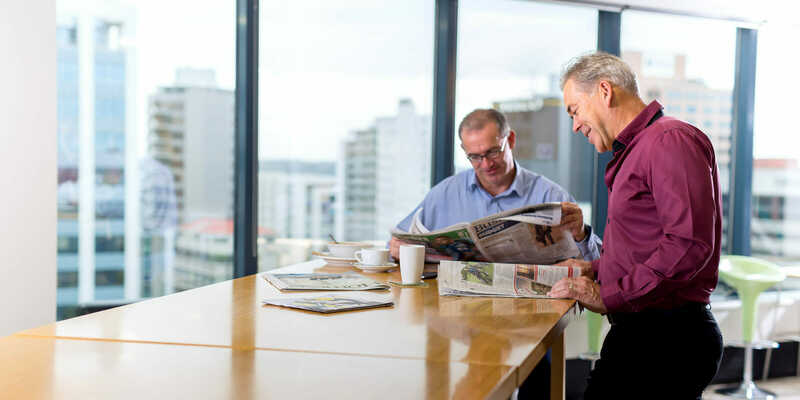 Kiwi Property will today unveil the new-look Aurora Centre at 56 The Terrace, following a $72 million refurbishment to accommodate the Ministry of Social Development on a new 18-year lease. As part of the extensive renovations, which combine the former Aurora Chambers and Unisys House into a single 24,000 sqm office complex, the company has returned a historic 1970s artwork ‘Flight’ to Wellington, having rescued the Patrick Leeming commission from a closing retail tenancy in Auckland. The artwork was originally commissioned in 1970 by the National Airways Corporation (NAC) for what was then its new head office at 80 The Terrace. Superimposed on a background of New Zealand coastline, ‘Flight’ is a dynamic representation of travel in the present and future. The artwork depicts towns and cities as seen from the air; flight paths between cities and over oceans, queues of passengers and space travel to the sun, moon, planets and beyond. Measuring 6.75 metres by 2.7 metres and weighing approximately three tonnes, the relief style mural was modelled in clay and cast in ten panels of reconstituted marble designed by Christchurch resident Patrick Leeming. Mr Leeming has today travelled to Wellington to see his mural in its new home – The Aurora Centre. This is the second time ‘Flight’ has been rehomed; in 1997, Patrick oversaw the relocation of the sculpture from NAC to the National Mutual Centre in Auckland. Nineteen years later, Kiwi Property has saved the sculpture, rescuing and refurbishing it to be returned to The Aurora Centre in Wellington – 1.2km from where it originally lived back in 1970. Mr Leeming is one of many New Zealand artists whose work is on display in Kiwi Property’s office portfolio, and feels privileged to still be involved with his artwork 46 years later. “You can imagine my surprise when I found out the news that ’Flight’ is to have another life back in Wellington. It is aptly named,” Mr Leeming said. The Ministry of Social Development will move into its new home progressively over the coming months – its move coming as part of the Wellington Office Accommodation Project in which the Government is seeking to reduce its office footprint in Wellington and save taxpayers’ money. Seismic strengthening has been completed on the original Unisys House, increasing it from 70% of New Building Standard to 90%. The Aurora Chambers was demolished to ground level and re-built with a steel frame structure, providing an additional level and floors that integrate with the refurbished tower.